A few days ago I had an experience of a lifetime. After all these years fly-fishing western rivers, it was my first experience standing in the stream just feet away from a great blue heron. But it wasn’t just the proximity. It was the duration: for more than an hour we stood together and fished. And despite shifting strong winds and rain we stayed, and we caught fish: I on a size 22 trico at the end of my line and she right smack on the point of her strong, spear-like beak. After a while I laid down my fly rod and just watched, awestruck. Her display of focus and agility quite simply blew me away. I want to be just like her – fierce and yet completely at ease, strong and gentle, able to move fluidly and decisively from a place of instinct rooted in a deep, visceral intuition. My work with senior leaders teaches me this is what they want too: authentic presence and the ability to adapt mid-stream in rapidly shifting conditions, without compromising their authenticity. And more and more, leaders are recognizing the benefits of cultivating this as an organizational value. The ROI + VOI is clear. If the infrastructure of any organization is human consciousness, doesn’t it make sense to value and nourish its flourishing? We can enter the ongoing stream, skillfully responding with discernment to what is called for now by titrating the right amount of gentleness, the right quality of fierceness – whatever it is that suits the particular circumstance. Over time and with practice these moments of presence – all tributaries to the main – gain momentum and eventually coalesce into a way of being. This is the elegance of presence: meeting the moment as it is from a place of intuitive ease that comes with being a well-integrated, highly functioning human animal. Presence is authenticity embodied. It is curious, open, decisive, creative, compassionate, and focused. And it hinges on the capacity to pay attention. In the same way that mental health is the most important determinant of physical health, a leader’s capacity to pay attention is the bedrock – and the strongest indicator – of her effectiveness. Attention is the basis for all higher cognitive function and it is the foundation of emotional intelligence. And mindfulness trains attention. Homo sapien sapien. Ours is the species named for the capacity to know and know that we know. Consciousness is our endowment. But in this age of increasing demand and complexity, maintaining presence is a tall order. It’s easy to find well-articulated formulas for how to be a great leader, from articles to workshops around top leadership competencies – all on point and all essential, yes, but all presupposing a strong capacity to pay attention. And since most of us are conditioned and inhabit habitual patterns of chronic distraction, it takes time actually practicing attention to build and reinforce the neural pathways that support it. I invite you right now to pause and see what it’s like to be embodied. We spend so much time in our heads – in conceptual-mind framework, and often forget we can tap the intelligence and wisdom of the body. So right now, an experiment: close your eyes and just see if it’s possible to sense into the body. To feel any sensation of sitting, breathing, presence of hands. Bringing the mind home to the body establishes present-moment awareness. Every single time. Fueled by endless input, the mind stays locked in the highly evaluative mode, scanning, categorizing and rigidly assessing: good, bad, this is safe, that is dangerous, stupid idea, great idea, and so on. This is a limited way of being. With mindfulness, the practice of paying attention in a certain way – on purpose, moment-to-moment, and with an open and kind curiosity, we find that we can stand in the stream of who we truly are and know why we are really here. We can show up with presence and authenticity, skillfully acting from instinct and intuition – even in the fray. With keen, embodied attention, we instinctively know what to say and do, and when and how to do it. We know when to pause; we know when to act. Yes, mindfulness practice helps us be present to our one precious life. It also shows up in challenging situations. In a high-stakes communication for example, with high-definition perception we notice a feeling – and can identify with precision what emotion is arising and its attendant physiological root in the body (lump in the throat, tightness in the chest, butterflies). Recognizing the ways our inner sensibility is comingling with external factors – and perhaps triggering conditioned patterns of mood, thought, and behavior, we intuitively know how to respond -- and this, my friend, feels like a superpower. Whole and integrated, seamless continuity. It is the essence of what it is to be a human animal. I emphasize the word practice as it’s an important distinction. This is a lifelong mind-body integration project that requires ongoing maintenance. It is fundamentally no different from learning to play the cello or build muscle in the gym: repetitive practice breeds familiarity and builds capacity. Of course the downstream effect is in full play: the awareness that arises from this practice makes space for choices out of intuitive, spacious discernment rather than contracted reactivity. The sense of freedom that accompanies this is exquisite. Another outcome – an especially beautiful and important one – is spontaneous compassion. Seeing clearly with an attitude of kindness and open curiosity invites a sense of shared humanity and a deeper understanding of one’s integration in the whole of things. We see ourselves and others as real live beings in all our complexity, messiness, and loveliness. Seeing ourselves in others and them in us is the birthplace of caring action. I invite you to open to the felt sense of the real you, well-integrated and whole. Embodied. Know when you feel presence, know when you don’t. Know when you are embodied; know when you are not. You are already equipped with everything you need; just practice. Go outside and observe in silence. Stand in the river with the heron. Dana Menlove mentors leaders who value consciousness, challenging and supporting them in forging deeper relationship with their own truth and insight to awaken authenticity. She teaches mindfulness and guides mind-body integration practices for individuals and small teams onsite, remotely, and at retreats in wild places, including an invitation-only Conscious Leader Retreat at a pristine lodge on the Middle Fork of the Salmon River deep in Idaho wilderness. 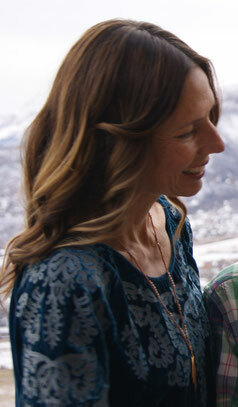 Her professional experience – enlivened by her lifelong contemplative wisdom practice – spans from raising and wild-releasing peregrine falcons on a remote mountaintop to advising in high-level political circles and corporate settings to naturalist guiding and meditation retreats in wilderness, where getting to the heart of things comes spontaneously.